Hemisphere’s central location on the 9th floor of the Hyatt Regency Orlando International Airport ensures that enjoying our spectacular views and culinary delights is always effortless. 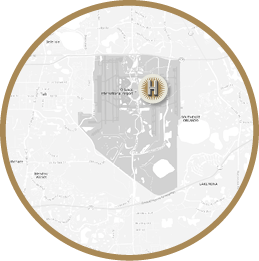 If you are driving from anywhere in Orlando, Hemisphere is less than a half hour away, and our Complimentary Valet for all guests makes parking a non-issue. Located in the Main Terminal, Hemisphere is easily accessible for travelers and non-travelers alike.